SEPTEMBER 2008 -- Last month I and a few other state officers met with the National Grange Membership/Leadership Director, Rusty Hunt. Naturally the topic was about membership. We talked about who the members of the Grange might be. There was talk of how people don’t have interest or don’t have time; that the schedule of their lives doesn’t allow for membership in the Grange. I am often traveling around the state of Connecticut. This meeting with Rusty was in Coventry. Noel Miller told me that their Grange was meeting in the oldest Grange building in the state of Connecticut. On the way to Coventry from my home in Chester I traveled the ‘back roads’ as the route was many miles shorter than taking the highway. There are two things that I notice in my travels. One is that I see many of what used to be small farms are now housing developments. Fields that my Dad would have loved to have used for crops now have five hundred thousand dollar houses in them. The other thing that I notice is the former Grange buildings that are still called Grange buildings but they don’t have a Grange meeting in them. These things give me a tremendous sense of loss. Depending on who in what Grange you may talk to, the Granges in Connecticut are just able to maintain their status quo. When Rusty talked about membership, he mentioned a pamphlet that he had about the four steps of recruitment of new members. They were as follows. Step 1: Set the Stage. As an Ambassador of the Grange you should identify yourself with the Grange by having some type of Grange memento on or about your person. Step 2: Listen. Learn what is important to the person and where there is a fit communicate how the Grange has similar interests. Step 3: Fill the Need. Communicate that the Grange can be the potential members answer to what they like doing. Step 4: Ask Them to Join. This is the most important step. Ask them directly, “Please join our Grange”. Try to have a membership form with you when you go out and meet people so that you may sign them up. There are many people who would love to get involved with their community if they could and someone would just ask. To me the most interesting thing that Rusty talked about was a new subordinate Grange that had formed in New Hampshire. 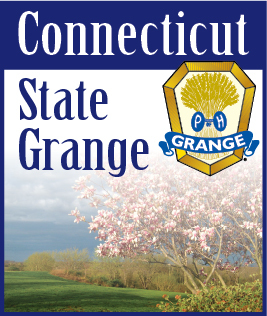 At some point in time I can imagine that each Grange in the State of Connecticut was a new Grange. He said that when it came right down to it a new Grange was easier to start than it was to keep some of the older Granges going. All that it took in this case was a group of friends looking to have a format to gatherings that they held. The Grange was the perfect answer as it is a wide spread organization with what many people see as ideal endeavors. I think that we as Grangers should take this as a personal challenge. When Rusty said all it took was a group of friends, I felt as if someone just had the nerve to say that a basic reason why my Grange might be failing was because I simply don’t have or don’t know how to make friends. I don’t know the feelings of other Grangers, but mine is a feeling of defiance. If our forefathers could have enough friends not only to form a Grange, but also in many communities to have the where-with-all to even have possession of their own building, then I would like to think that we as Grangers should have the ability to maintain our own. I would even like to think that the Grange is so GREAT that we could even influence people to start NEW Granges. Have you ever thought about it? I think it would be great to have all our Grange members feeling the way that I do and then doing something about it.